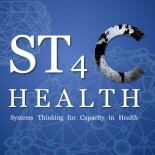 Systems Thinking for Capacity in Health (ST4C Health) is a group of health professionals, students, and concerned citizens dedicated to the strengthening of health systems in low income countries around the globe. We strongly believe that systems thinking – a novel way of thinking about and approaching health – is a new frontier with significant potential for strengthening health systems and building capacity. Systems thinking is a transformational way of thinking about and approaching health. In the past we have witnessed tremendous successes in global health – such as the eradication of smallpox and the treatment of diarrhea with oral rehydration solutions – by considering one aspect of health in isolation, whether it be a specific patient, disease, project, or policy. However, the real world is very complex, and our fragmented approach has too often resulted in unintended consequences such as dependency, inefficiencies, and inequities. Systems thinking is based on the idea that when all stakeholders and their interactions are considered as a whole, we can better understand health problems than we can when viewing each part in isolation. Such an approach means that we must consider economic, political, and social factors – factors that might at first seem unrelated to health. Also, since health challenges are complex, and solutions differ depending on time and place, we cannot impose a top-down plan of action and expect predictable, positive results all the time. From a systems thinking perspective, it is often best to facilitate an environment where local people and communities self-organize to improve health, leading to unplanned positive results. Systems thinking provides the principles, approaches, and methods to rethink our basic assumptions about health, and unite to create the future we want. We invite all health professionals to join us as we seek to promote systems thinking concepts and approaches globally. We are constantly striving to expand our connections with those in various disciplines throughout the world in hopes to increase learning through shared experiences. There are many ways to get involved; please connect with us via Facebook, Twitter, LinkedIn, and our blog. This work is supported by the African Health Initiative of the Doris Duke Charitable Foundation. One application for systems thinking is health system improvement and developmetnt. Read about the topic here! This entry was posted on July 1, 2013 by chads in Uncategorized and tagged Complex Adaptive Systems, complexity, Global Health, Health, initiative, social media, stakeholders, Sustainable, Systems Thinking.